Ladakh Festival: Celebrating Life & Beyond. The Ladakh Festival is an annual week-long gala organised by the Tourism Department of the Jammu & Kashmir Government every September in Leh and its surrounding villages. Local communities along with the district administrations of Leh come together to showcase the culture and traditions of this land of stunning landscape to the visiting tourists, for after all the region survives and thrives on tourism. According to the rich heritage of this former Himalayan Kingdom, every important occasion in a person’s lifetime is marked by feasting and dancing to folk songs, be it a birth, marriage, the beginning of a new year or even the start of a season when the flowers begin to bloom. The most popular ones though are the Monastic Festivals celebrated to commemorate the founding of a monastery. What with Ladakh having found a place in every Photographer’s heart and Travel Enthusiast’s bucket list, these festivals only seem to grow in scale every year. As summer comes to an end, both the festivals and the tourists begin to go back to easier terrains and the Ladakh Festival comes at just such a time, tempting you to stay back just a while longer. On the first day of the festival, all the locals participating and performing at the cultural events in the opening ceremony start off in a procession, dressed in traditional attire. Some of who even bring out the rare antique jewellery, headgear, jackets and such that have been in their family for generations and which cannot now be duplicated by the modern day artisans. As these groups of local leaders, tribal men and women, artisits and school children weave their way through the Leh market to the Polo Grounds where the inaugural ceremony of the festival is held, you can only be spell bound by the colour you see and the beauty of happy locals against the stark backdrop of their desert landscape. At the Polo grounds, it is time to settle down and take in the show that is being put on not just by the natives of the region but also by those Tibetan refugees who have made India their home. Experience their way of life and age old traditions through the masked rituals, folk songs & music and even through the reenactment of royal court dances. As most of their festivals celebrate life, besides seeking peace and warding off evil, the performance to their folk song of Marriage is the most intriguing. Marriage ceremonies in Ladakh begin with the boy’s family sending Chaang or the local beer to the girl’s family, from when start the many events that culminate in the wedding feast. One such ceremony is the Nyopjhol, where Nyopas i.e the bridegroom’s friends go to the brides house to fetch her. This ceremony depicted in dance form at the festival is a sight to see, as spectacularly dressed ladakhis in the ceremonial costume of the Nyopas – who play a very important role all the through the wedding – dance to the Marriage Song in accompaniment to the music played on the traditional instruments, Daman and Surna. The cultural programmes in Leh end by afternoon, after which the festival then moves on to other parts of Ladakh. 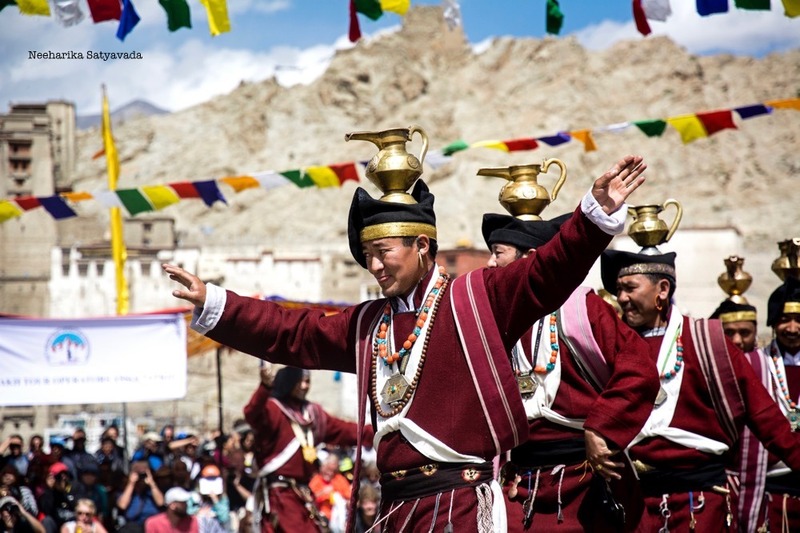 All in all, the Ladakh Festival is a wonderful way to experience the culture and heritage of this region, so if you are planning a trip to Ladakh do take into account this festival! Looks like a great celebration!